Each year, generally in May, the Energy Information Administration publishes a less-than-eagerly-anticipated tome called the International Energy Outlook, 250+ pages of mind-numbing text, charts, graphs, and tables. No one reads it. The mainstream media ignore it. It抯 the product of the best prognosticators in the Department of Energy. Okay, that may be what puts most people off. But if you抮e patient enough to dig into it, it will cough up some fascinating nuggets of information. The present edition is no exception. The report refrains from spelling out the conclusion that seems most obvious from its data. However, confirming a trend begun just last year, the 2009 edition clearly reveals that the government has been forced to admit that Peak Oil is coming. Moreover, it抯 expected to arrive much faster than was believed as recently as two years ago. This represents a remarkable turnaround in the agency抯 opinion. Up until 2008, they were predicting unbroken growth in world oil supplies for the next two decades. But in � and �, the rosy picture turned decidedly unrosier. Before we look at the numbers, a couple of notes on terminology. The EIA makes its projections based on what its analysts call the 搑eference case,� i.e., average economic growth. It also provides estimates for better- and worse-case scenarios, but the reference case represents the best guesses they have. Oil (as we generally think of it), upon which most of the world economy depends, is termed 揷onventional liquids,� i.e., the stuff that comes gushing up from under Saudi sands. 揢nconventional liquids� � extra-heavy oil, bitumen, coal-to-liquids, gas-to-liquids, and biofuels � are also covered in the report, as we抣l see, but conventional is far and away the most important one at this moment in history. 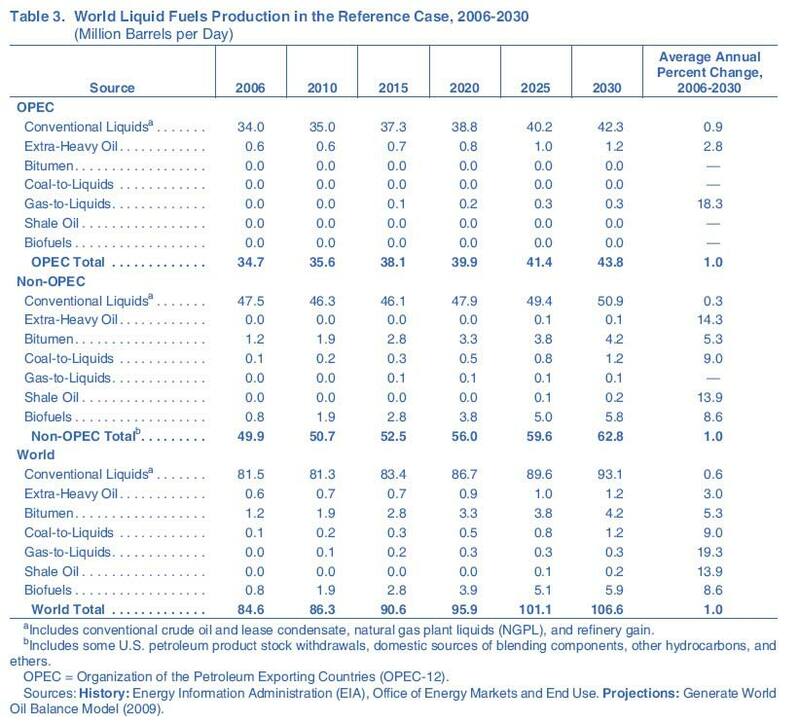 With that in mind, by 2007 the IEO was in its final year of irrational exuberance, confidently predicting that world production of conventional liquids would be 107.5 million barrels/day (up from 81.9 in 2005). That dovetailed nicely with a forecast for world demand of 118 million b/d, with 10.5 million barrels of unconventional liquids taking up the slack. Projected production, as you can see, is suddenly shriveling up. From 107.5 million b/d of oil projected for 2030 in 2007, to 102.9 million b/d in 2008, to this year抯 meager expectation for 93.1 million. That抯 a drop of 13.4% in only two years, and posits production growth of only 11.6 million b/d (14.2%) from 2006 levels. If that isn抰 an admission that the era of Peak Oil is upon us, what is? Does this seem optimistic? Well, it presupposes some heavy lifting on the part of OPEC, a dicey proposition in the best of times. And it means creation of the infrastructure necessary to exploit extra-heavy oils, tar sands, shale, ultradeep deposits and other unconventionals, all of which require sophisticated technological know-how and face significant environmental challenges. Biofuel production could more easily be elevated. But to reach the lofty level of nearly 6 million b/d would necessitate a huge diversion of cropland from food to energy, certain to be attended by a rise in food prices, not to mention potentially serious food shortages. The need for food being rather more primal than the need for gasoline, politicians are going to be reluctant to risk loosing angry mobs into the streets. Even if all of these developments proceed flawlessly, though, we抣l still have to face a widening gap between production and consumption. Or will we? As it turns out, we抮e in luck! Or so the EIA would have us believe. Because, accompanying that falling supply is � you guessed it � declining demand. 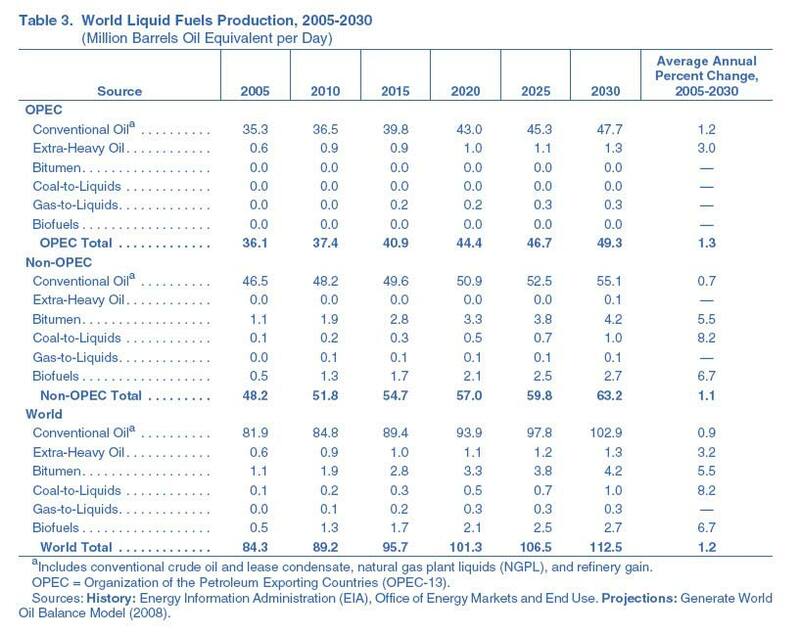 In 2007, the IEO anticipated world demand for all liquids of 118 million b/d in 2030. This year, that estimate shrank to 107 million b/d, right in line with production. The important point to take away from the IEO抯 analysis is that the world is facing a decline in liquid fuel production and the government, after years of straight-faced denial, is now admitting it. Does this mean we抮e going to run out of oil? No. But supply constrictions mean that the good old days of limitless, cheap oil are gone. And, though viable alternatives eventually will be developed, there抯 no way of putting a timetable on that. In the interim, we抮e going to have to pay up if we want to keep the family jalopy on the road. How much? The IEO report抯 reference case calls for $130/barrel oil in 2030, but that抯 based on relatively modest demand increases from India, China, and other developing nations, and we find it very optimistic. It easily could be twice that. Rising oil prices mean some belt-tightening, but they also offer investment opportunities, in both conventional and unconventional resource companies. In addition, power-generation alternatives such as solar, nuclear, and geothermal will be coming to the fore. But discovering the right companies with sound fundamentals and the potential for handsome returns isn抰 easy. Read our report how a math-prodigy-turned-multimillionaire finds those companies� and how you, too, can profit from his secret system. Click here to learn more.